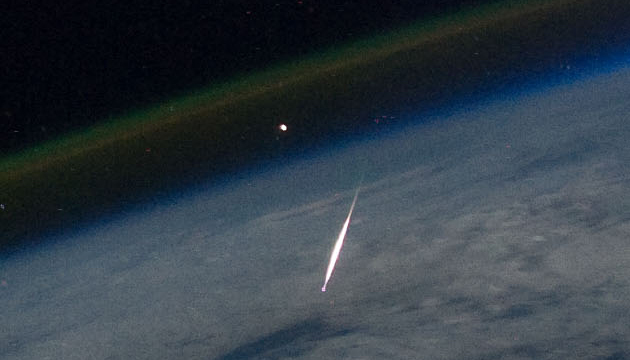 Perseid meteor imaged by Ron Garan on the International Space Station in 2011. It's time to drive headlong again into a cosmic bug swarm and watch the streaks they leave on the window pane of Earth's atmosphere. Let's try that again: It's time to sweep up the dandruff left strewn through space by the hairy head of a passing comet. Third try: It's time to enjoy the annual Perseid meteors, the Old Faithful of meteor showers that lights up the August night and thoroughly delights those sleepy souls willing to stay up past midnight for one of nature's original fireworks shows. Much better. For years I've been describing meteor showers as the streaks of bug-guts on a car windshield--I just think that says it all. A car speeding down the freeway drives through a stream of migrating insects, collecting streaks on the leading windshield from the ones it hits, but none on the rear window which trails the car. I was once advised to be more poetic, and less "ick-factor," when describing the beauty of a shooting star...oh well. At this time, in early August, Earth is passing through a lane of dust particles left behind by the passage of a comet through the inner solar system. Comets are balls of ice, dust, and rock. When they pass close to the sun, some of their ices are vaporized and shed into space as gas, carrying dust particles with it. It takes a couple of weeks for us to pass completely through the dust stream, but on August 11 and 12, we will be in the densest part of the cloud when the number of bug streaks...I mean meteors...is greatest. Best viewing is during the morning hours of Monday, August 12. This is a good year to see Perseids; the waxing crescent moon will have long since set by the time the best shower viewing gets going post midnight (and best around 2 or 3 AM.) That's because the morning side of the Earth faces the direction of its motion and leads into the dust trail that produces the Perseids. Under the morning sky, you are under Earth's atmospheric "windshield." You can't see a lot of meteors before midnight since evening skies are on Earth's trailing side. And if you live in or near a city, getting up past midnight is only the first step in Perseid catching. Getting away from city lights is the second step. Around the San Francisco Bay, some places you can get to without making a long trip include the Santa Cruz mountains (if you can find a spot with few trees), or north along Skyline Blvd. from Highway 9 to 92 (if fog isn't a factor). In the South Bay, Henry Coe State Park is an excellent choice, with fairly dark skies, open spaces, and most importantly it is open 24x7. In the East Bay, Mount Diablo is a good locale, though the gate to the top of the mountain closes after sunset. The East Bay hills from south of Hayward up to Berkeley and Albany have plenty of dark spots along the ridge that are relatively shielded from city lights. The North Bay offers plenty of relatively dark sky zones from Point Reyes through Sonoma County and into Napa. For best viewing, face to the northeast after midnight; the constellation Perseus, the Perseids' namesake and where the meteors appear to streak from, rises there shortly before midnight and spends the morning hours climbing higher in the eastern sky. Having a clear view of the northeastern horizon is a plus here. If you're wondering which hairy comet shed the dandruff that produces this meteor shower, it's comet Swift-Tuttle, a 16-mile sized chunk of ice, dust and probably some rock that orbits the sun every 133 years. Swift-Tuttle made its latest close passage by the sun in 1992--so we don't expect it back again until around 2125. But its "children," the dust specks of the Perseid meteor shower, can be seen every year at this time. If you have never made the time and effort to see a meteor shower in the way that is really required, here's your chance! Yes, it's a Monday morning, but don't let that stop you. If the weather cooperates, you will not regret the loss of sleep.